I stamped a trimmed panel with the flowers, and filled in open spaces with the 3 dots stamp in the package. I was looking for a color to match the leaves, and happened across this previously cut Happy Birthday die, which works exactly with that color, and the glitter also pops from the stamping. Then I decided to cut out a central circle and pop the panel above my card base, with a pool insert inside the circle. And I added a flower to the center of that circle. Today I'm playing with my new stamps and matching die again, and was taken with a card from Concord & 9th on their website. That version had stamped stripes running horizontally and orange flowers. Here's my version. I love black and bright yellow combinations, so after I decided to use the black and white stripe for my background, I chose yellows for my stamped flowers. I sized the striped background to A2, then cut out 2 of the sprigs using the die. On a white card base I used the striped panel to help me position where to stamp the flowers and leaves. I knew that I wanted to lift the striped panel above the stamped card base, but it wasn't until near the end that I decided to also add the die-cut outline in charcoal; I think it gives the stamped image more definition. Then in order to hold that outline into my striped panel, I lined it on the back with pieces of acetate to give me something to glue the outline to. Then I just added my sentiment from the stamp set panel and popped it above the card base. Our theme this week is the ever-popular Anything Goes and my teamies and I are showcasing Wplus9 products. Today I have a delicate pastel card and one that is much bolder in color. This die-cut has the loveliest details - see the little tulips and forget-me-not clusters? And I added these 5-petal flowers stamped in purples because there were similar flowers in the cover die also. As much as I love all of Dawn's beautiful flowers, I still have a soft spot in my heart for her Quilt Prints stamp set from 2010. I have used it many times, but never in patriotic colors, and since the 4th of July is coming up, that's what I decided to do this time. We all have picnics on the 4th, so here's a picnic quilt for the occasion! supplies: white, Simon's Navy and Schoolhouse Red card stock, Wplus9's Quilt Prints stamp set, Hero Arts Celebrate Everyday sentiment, Hero Arts Red Royal, Navy, and Soft Granite inks, herringbone embossing folder for the "quilting"
I stamped the "stitching" in grey ink, then used the patterned pieces to add red and navy details. Everything is in the set except the diamond with a heart in it. As I often like to do, I embossed the stamped panel to give it a dimpled feel before I "bound" it in red. And I used the same inks to stamp my sentiment banner. 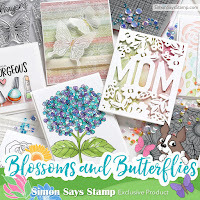 Here's a card I made that CASEs one of my Simon Says Stamp teamies, Debby Yates.....she has a wonderful talent for mixing design papers with a stamped image. I CASE'd THIS CARD of hers from last week. 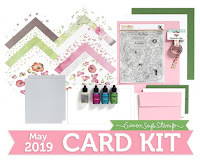 I CASEd her sketch and use of coordinating plaid, dots, and stripes, and changed up my stamped image to a summer flower. Thank you, Debby, for your wonderful inspiration! 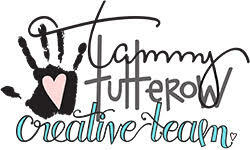 For more of her beautiful designs, visit her blog, A Scrapjourney. Hope you're enjoying a lovely summer day! I just received a set of Concord & 9th stamps and a coordinating die, and had a play with them. I chose a deep Chocolate for my background, accented with white, to go along with my aqua flowers. And I used the stamens from the stamp set to add a little detail to the large flowers. Hopefully I'll be able to play with the layering stamp set next. 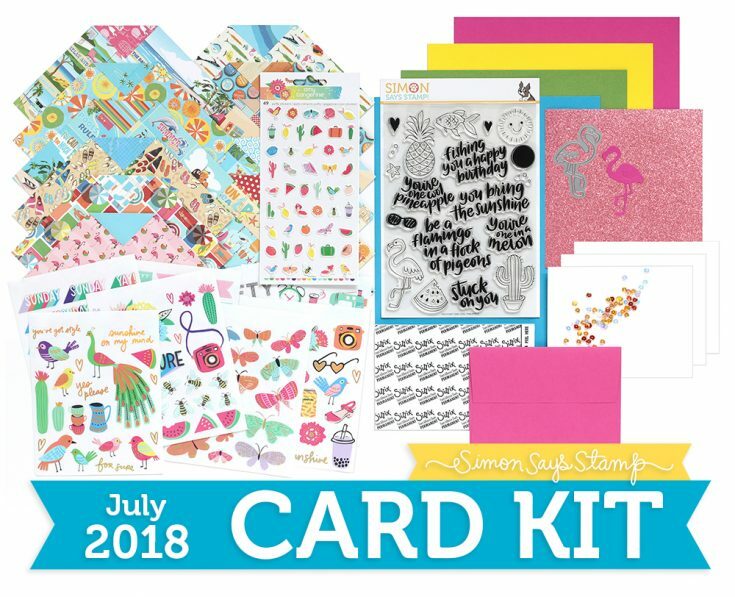 Here's another card from the Simon Says Stamp July Card Kit: Cool Summer. The heart sunglasses just crack me up! I grinned all the way through making this! And I definitely liked applying the oxides with the blending brush, which I think came in a past month's card kit......I plan to get myself a few more of them. I've been wanting to play with this color combination for awhile, and today's the day! This IO cling combines brush strokes into a striped background, but inking it in different colors like this, it would have been more efficient to use just a brush stroke stamp, as I masked and stamped each color separately. I do love these colors together, though. After I had inked my background, I used the same colors to make my flowers, adding a black dotted center to them to balance out my black sentiment die. We've had all kinds of weather here today - torrential downpours followed by sunshine followed by clouds. Hope you're enjoying your day whether you're in or out! 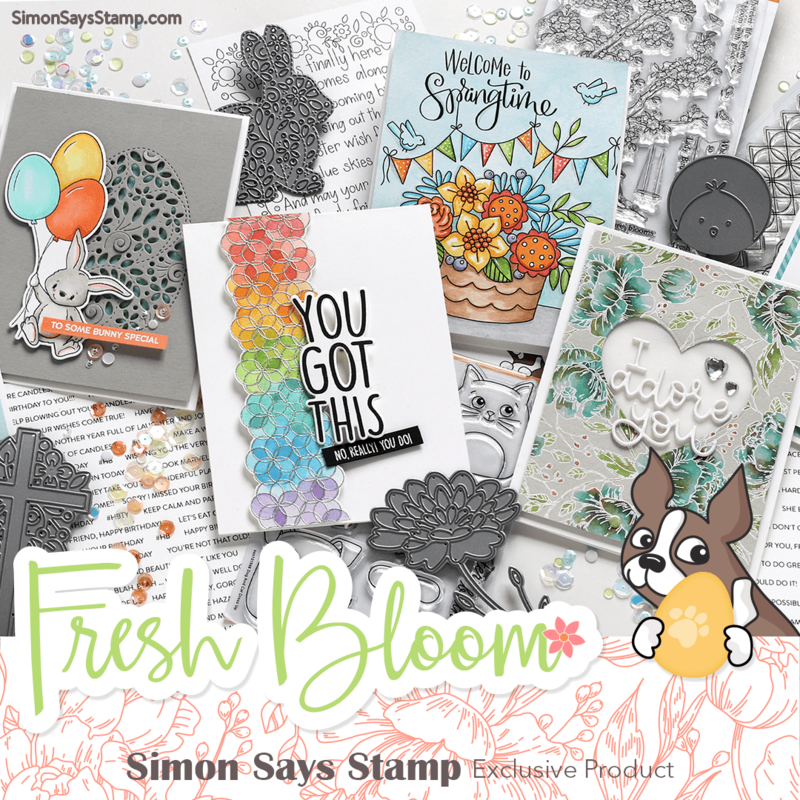 I was in the mood for using some cute critters, and I dug out a couple Avery Elle stamp sets and combined them with a sentiment from Simon. I've always been drawn to little fawns, and this one shouldn't be confined just to Christmas. 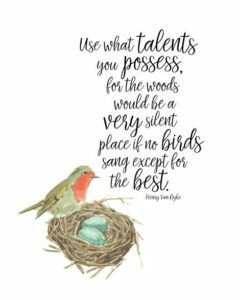 This card takes me back to Disney's Bambi; I recently shared some excerpts on You Tube from it with my Grands and we were all enchanted with it! Mine arrived yesterday, and still in the tropical mood from yesterday's release at Simon, I made an easy card using some elements from this fun kit called Cool Summer. Did you know that the fun flamingo die fits the stamped version perfectly? I simply stamped it on Doll Pink card, and then cut it out with the die. Love the bold font of the sentiments in this set; here I fussy-cut part of one of them, abbreviating the full sentiment. Everything on my card except for the bright pink sequins is in this kit. 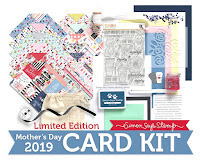 Considering that this new stamp set is a larger than usual one, the value of this kit is pretty amazing versus what you'd pay separately for the elements inside it! Our theme this week is Bright and Cheerful, and we're highlighting Hero Arts products! One of the best things Hero Arts did was to introduce Color Layering stamps. I have several of them, and I'm glad to see that they continue to add new sets with each release. First up, what's more bright and cheerful than a butterfly?! I imagined these flowers to be zinnias and stamped them in shades of pink. This set has 3 layers for the butterfly and the flower, and I used my Misti to line them up. I've had this flamingo set for awhile and I don't think I'll ever tire of playing with it - it always makes me smile! This time I added a party hat to the mix and made a summer birthday card. 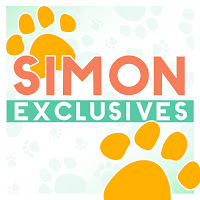 And just a reminder to visit HERE to see Simon's newest release, Good Vibes. If you'd like to see the card I made with my new die, please scroll down 1 post, or click HERE. A New Simon Release: Good Vibes! Simon has a new release debuting today, called Good Vibes! I was lucky enough to have been sent this really fun set of dies, called Perforated Flaps. There are 3 sizes, and for this card, I used the smallest one. This is how the card will appear when you take it out of its envelope. The new dies cut 3 different sizes of a 3-sided window, leaving the top attached to be folded up for a surprise underneath. I used the smallest flap, cut from my stamped and colored flower panel. Then the panel was popped above my card base on which I had stamped my sentiment. I also added a small vellum panel with a sentiment to the "door". Here's one more look at the card with the flap closed. 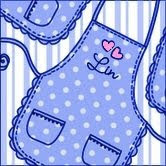 All my supplies are listed below this picture. Be sure to visit THIS PAGE to see the rest of the new release. I have my eye on the Hibiscus Frame, Everett Letters, and the Classic Bicycle dies. What are your favorites? Thanks for stopping by! 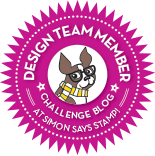 I hope you'll visit again later this morning for my regular Simon Says Stamp Wednesday blog post. I just received a new stamp set from Altenew - my favorite of their new release. It's one of their layered sets, but on a much smaller scale than their usual large flowers. Here is my first play with it. I decided I'd use this pretty little floral above and below a central sentiment. After I saw it inked, it reminded me of the embroidery on ladies' handkerchiefs, so I cut the panel into a large scalloped rectangle, and added the hello die because of it's pretty feminine font. I love florals mixed with stripes, so I cut my stamped panel down a bit and added some stripes above and below it. Again, I chose my sentiment because of the lovely font. This set is easy AND fun to use, and I know it will become one of my favorites. 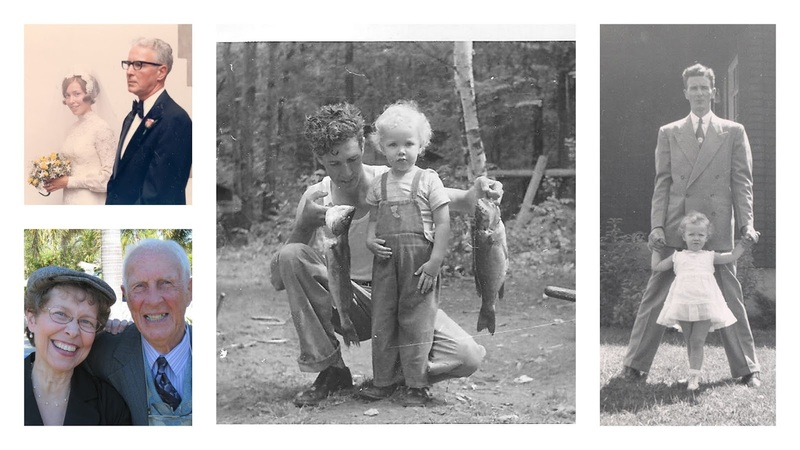 Remembering my Dad on Father's Day, I did a little collage of the few pictures I have of the 2 of us. My Dad was born in 1920, and we had him for 95 years. He was an avid outdoorsman; loved to hunt and fish and just be outside. He never sat down, always kept busy. My sisters and I have fond memories of our summer vacations in Canada. On a high school diploma, he put his 3 daughters through college, and built the house that we grew up in. After he retired, he took the time to write down his memories of his life, and that little book is a treasure! He always had a joke to tell. He loved spending the winter months in Florida, and one of my favorite memories is of him riding his bike every day with his little dachshund in the basket, even in his 90's! He and Mom were married for 70 years, and I count myself truly blessed to have had them as my parents and role models. To begin I cut a piece of the clear acetate designer toner sheet and a piece of foil and ran it through my laminator. I set aside the foil, and colored the reverse of the acetate with alcohol inks. Then I framed it. As you can see, the light plays with the foiling and gives all kinds of different looks. From a distance, depending on which way you tilt your head, the background turns to purple, gold, green, or blue - so fun! What I was unable to capture in my photos was the dimension, almost a shadow-box effect that lifting the clear panel gives to it. You can kind of think of this design as a shaker card minus the shakings! 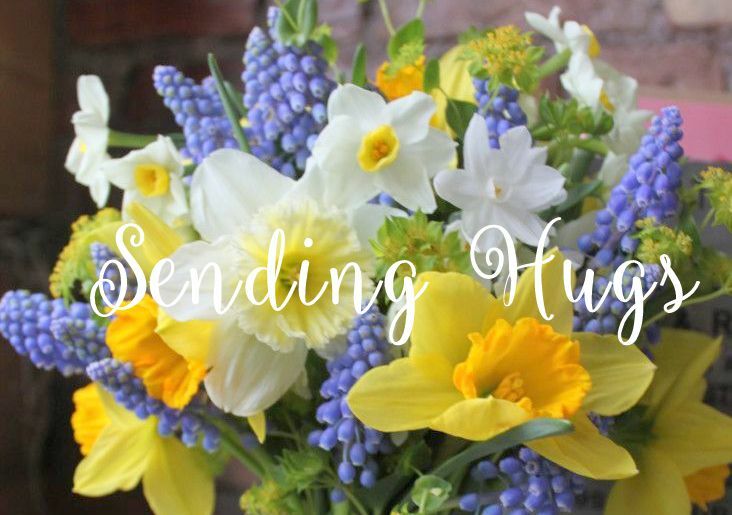 Thanks for stopping by today - I hope your weekend will be a fantastic one! Our theme is a fun one this week: Frame It! And the team are playing with Memory Box goodies. I found an interesting die and made 2 very similar cards with it, using items from my scrap basket. After assembling the panel with the Circle Burst, I popped it above my peach backing. There's a large version of this die, also, but I chose this version, thinking it would make a good sun in the corner of a card.......yet it's still large enough to have a small sentiment inside it. I recently ordered and received this oh-so-pretty Tossed Florals cover die and here's a card I made that features it. I wanted to color it with softened sherbet-y summer colors, so I smooshed various mini inks on an acrylic block, and used them to watercolor the flowers and leaves. I didn't want to cover up much of the pretty result, so I chose to add a sentiment in a small circle. The butterfly was sitting on my desk and it seemed like a nice addition to the mix. Just playing today; this one uses dies and lots of texture! It's no secret if you visit here often that my favorite rose is a yellow one. So I played a little with the yellow card stock in my stash until I found 2 colors that I liked together. The roses and leaves are 3 layers, a solid back, a detail layer, and a framing one. I thought adding something spikey would change things from the other cards I've done with this set of dies. ......this one for my husband this year. This bird die has always been a favorite of mine - it fits into most wreaths or branches, so I first cut out 2 of him from desert storm kraft card and inked them to resemble bluebirds. I cut 2 shades of green for my wreath, and, influenced by Pam's 2nd card in THIS post, sponged some tea dye distress ink around the wreath and the edges of my card. It's been 47 years for us - how about you?